Perhaps more than with any addiction, many people struggle to understand eating disorders. The solution seems so simple; if you have anorexia, eat more and gain weight. If you binge eat, just eat less. It is likely anyone suffering from eating disorders will have heard these things countless times, often said with good intentions but invariably doing more harm than good. The reality is, of course, anything but simple. For people with eating disorders, issues around food and eating can come to dominate their waking lives in ways which they may feel powerless to control. Anorexia Nervosa (Anorexia), is characterized by the attempt to keep weight levels as low as possible by not eating. Sometimes, this is accompanied by intensive exercise and/or purging of food through laxatives, diuretics, enemas or self-induced vomiting. Anorexia is characterized by extreme body dissatisfaction, a delusion of being fat and an obsession with being thinner, no matter how much weight has been lost. Bulimia Nervosa (Bulimia), is an illness in which the person binge eats and then purges, most often through self-induced vomiting or taking laxatives or diuretics. Sometimes, the person may not regularly purge, but instead exercise intensively in compensation for the binges. Binge eating in people with bulimia generally involves large amounts of food, often high in sugar and carbohydrates, that may be consumed rapidly and in secrecy, until the person reaches extreme fullness. The binge may be planned or unplanned, and is often triggered by stress, negative mood or extreme hunger resulting from intensive exercise between binges. Binge Eating Disorder, is characterized by binge eating large amounts of food in short periods of time, on a regular basis and without purging afterwards. People who binge eat might feel a lack of control over their eating, often eating rapidly, alone and until they are uncomfortably full. They may also feel strong negative emotions in regards to their eating, often feeling depressed, guilty or disgusted with themselves after overeating. 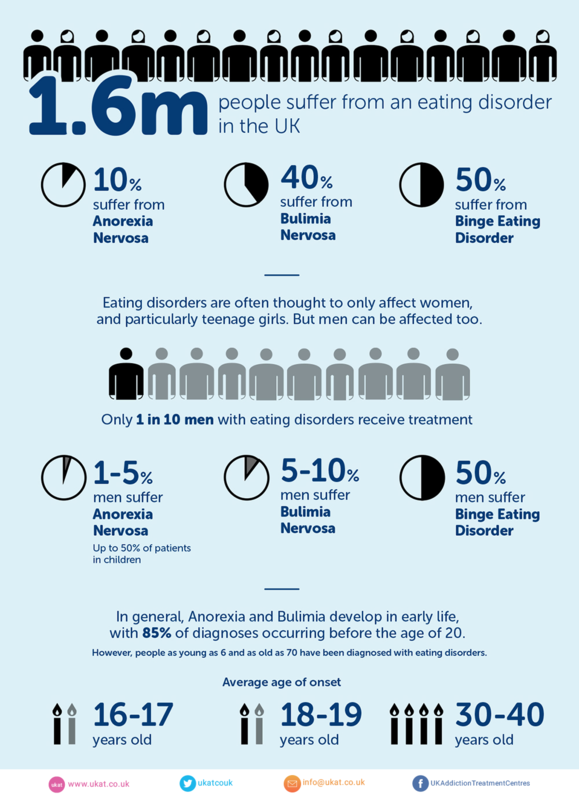 Figures for the amount of people suffering from eating disorders vary hugely. Research carried out by BEAT, an eating disorders charity in the UK, estimates that more than 725,000 people in Britain suffer from an eating disorder, but others put the number as high as 1.6 million. But many sufferers do not seek help, so it is likely the real number is even higher. All eating disorders are psychological conditions at root, but they are characterized by the behavioural complications and physical health problems that are characteristic of the illnesses. The underlying psychological disorders are often complex and, as a result, for many years the medical profession tended to side-line the mental health aspects of eating disorders, treating them instead with dietary rather than psychological interventions. Now, this has changed; in recent years large amounts of research have been done into the psychological, neurochemical and environmental characteristics of eating disorders, shedding light on the causes, complications and treatment options. Although it is less common than bulimia and binge eating, anorexia is perhaps the most famous eating disorder. It is often associated with teenage girls, and there is some truth in this; girls in their teens make up about 85% of anorexia diagnoses. However, anorexia affects people across all demographics. What causes anorexia has been the subject of much debate over the last three years. Traditionally it has been regarded as a disorder with social and cultural explanations, often thought to result from a drive for thinness and physical perfection in western cultures. Others placed emphasis on gender dynamics, arguing anorexia is caused by power struggles between the sexes. But while both of these factors play a role, recent advances in science have shown that it is biology and genetics that complete the puzzle. It is through understanding the complex interaction between biology and environment that anorexia can be understood and effectively treated. Research suggests that these personality traits may be directly linked to the underlying genetics of the individual, and the race is on to find specific genes that relate to the neurochemistry of eating behaviour. One of the key biological findings is the role of a neurochemical called serotonin. Brain imaging has shown how people with anorexia normally have unusually high levels serotonin both before developing the illness and after recovering from it. Serotonin is most widely known as a ‘feel good’ chemical, as low levels of it can cause depression. However, high levels of serotonin can cause anxiety, behavioural inhibition and body perception issues. Serotonin production is directly related to food, as the body synthesises the chemical from an amino acid called tryptophan, which we get from food. If you eat less food, you get less tryptophan, and hence less serotonin. As such, for those predisposed to anorexia, not eating may reduce the symptoms of anxiety and behavioural inhibition that come with increased serotonin levels. The problem is that the brain responds to this by increasing the amount of serotonin receptors, in order to increase sensitivity to serotonin in compensation for the lowered levels of the chemical. Then, when the person eats again, the brain floods with serotonin and old feelings of anxiety return, this time amplified. In reaction, the person returns to starving themselves in order to feel better and, in this way, starts to become locked in the anorexia trap. Serotonin is just one of a number of chemicals involved in anorexia, and scientists are continuing their work trying to understand the roles of different areas of the brain in the disorder. Almost all are finding similar things; that the regions of the brain impacted by starvation include those that play a crucial role in emotions, personality and rewards. Many believe that anorexia shares similarities with addiction as, like drugs, self-starvation produces chemical changes in the brains which impact behaviour and emotions. This knowledge is crucial in informing ways of treating the illness. Bulimia has been the subject of considerably less scientific research than anorexia, and as such the disorder remains relatively poorly understood. The causes of bulimia are believed to share much in common with anorexia – many of the personality traits and neurochemical patterns that have been observed in anorexics have also been recorded in those suffering from bulimia. However, there are some crucial differences, and the historic tendency for support programs to simply lump the two disorders together has been detrimental to treatment and recovery. Binge eating disorder may at first appear dissimilar from other eating disorders. However, like bulimia and anorexia, binge eating is often the result of complex underlying psychological conditions which demand thorough understanding if treatment is to be effective. Binge eating is often referred to as ‘food addiction’ as it shares much in common with drug and alcohol dependencies. Both binge eating and addiction are characterized by the continued pattern of excessive consumption despite negative consequences, whether physical, emotional or external. Scientists have found this even occurs with animals: studies have shown that when rats are given highly palatable foods, such as those high in sugar, carbohydrates or fats, they will display the characteristics of binge eating, consuming as much as possible in short time periods. This remained true even when the scientists started attaching electrical probes to the food – the rats would continue to eat again and again even if it meant getting hit with a jolt of electricity. To understand why this happened, the scientists analysed the brains of the rats. A key neurochemical in addiction is dopamine, which is a central part of the brain’s pleasure and reward system. Dopamine becomes ‘activated’ – released in greater than usual quantities – when drugs or alcohol are consumed. When the rats binge ate on highly palatable foods, they exhibited dopamine activation. More importantly, this same response continued every time they binge ate, rather than diminishing over time as is expected. This is a hallmark of addiction and can help explain why binge eating can be so hard to stop. Risk of heart failure, due to the slowing of the heart rate and reduction of blood pressure caused by starvation. Osteoporosis, which is the reduction of bone density, resulting in dry, brittle bones. Anorexia is normally accompanied by a number of mental health complications. This often referred to as comorbidity, as the mental health problems co-exist with the physical problems of anorexia. However, for many people, the physical and psychological effects may feel intrinsically intertwined, with psychological distress often increasing over time. Depression is the most common psychological symptom; up to 63% of people with anorexia suffer from depression at some point during their illness. Obsessive compulsive disorder (OCD) is believed to affect 35% of people with anorexia. Anxiety is almost uniform among anorexia sufferers, both before and during the illness. Often anxiety increases over the duration that the person suffers from anorexia. Binge eating can increase the amount of insulin in the body, while purging depletes insulin levels. This instability can lead to type 2 diabetes, and the condition is often associated with bulimia. The physical complications caused by binge eating can be twofold. First are the more immediate effects on the digestive tract, which in turn can lead to problems throughout the body. If continued over time, this can lead to obesity, and all of the health risks associated with the condition. Over two thirds of people with binge eating disorder are overweight or obese. Being overweight increases the risk of heart disease, as the build-up of fat, especially around the belly, makes it harder for the heart to pump blood to the lungs and belly. This increases blood pressure, which in turn increases the risk of having a heart attack and stroke. Type 2 diabetes occurs when blood sugar levels get too high, and can be caused by over eating of carbohydrates and sugar. It often accompanies binge eating disorder, especially – the not exclusively – when the sufferer is overweight. Coronary heart disease occurs when a waxy substance called plaque builds up in the arteries and reduces the flow of blood to the heart. This can cause angina or a heart attack, and is exacerbated by obesity. Gallbladder disease and gallstones are common among people with binge eating disorders and overweight people in general. Gallstones are mostly made of cholesterol and can cause stomach and/or back pain. Sleep Apnea is a common disorder in which you have one or more pauses in breathing while you sleep. It can be caused by a store up of fat around the neck, which obstructs the airways. Alongside the physical complications that can result from binge eating, a number of physiological problems are very common among suffers of the disorder. These can come in almost any shape or size, though it is depression and anxiety that afflicts the largest amount of patients. Often, the psychological difficulties come first, with binge eating beginning as a ‘comfort’ mechanism, as a way to boost the mood. However, this can lead to feelings of guilt and low self-esteem, which can in turn lead to further binging, beginning a vicious cycle that can be hard to break. In the medical community, eating disorders are often referred to as being psycho-physical, meaning treatment must look both at the mind and body together. This remains true whether we are talking about anorexia, bulimia or binge eating disorder – all must be approached holistically. How this is managed should be tailored closely to the specifics of each patient, taking into account not only the type of eating disorder they suffer from, but also the many factors which make up their personal situation. This should be clear from the outset, and so the first step in most treatment programmes will be for a doctor to carry out a physical assessment to ascertain any immediate danger the patient may be in, and how the body can be restored to health. This will lay the foundations for a dietary programme, which will be accompanied by dietary counselling evaluated throughout the treatment. Following this, a personal assessment is conducted by a therapist. This will allow the remainder of therapy to be tailored to the patient’s needs. There are a number of types of therapy that are used to treat eating disorders, including family counselling, psychotherapy, Cognitive behavioural therapy and group therapy.